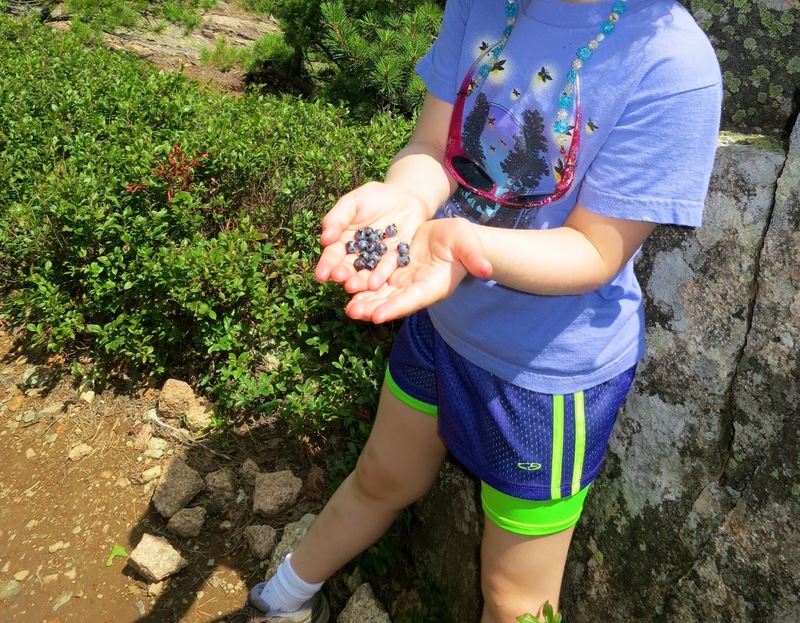 On a recent flight home, I eavesdropped as my daughter explained to a new friend that we'd visited Maine because "my mom really likes blueberries and lobster." After a week of scrambling over boulders, biking on carriage roads, and swimming in icy-cold lakes, my child absorbed my love of...food. Couldn't she read the pleasure behind my grimace as we clawed our way up Dorr and Cadillac Mountains? Apparently not, but she took pleasure in scolding me for stopping every few feet to pick and shove blueberries in my mouth. While sweating it out to reach a mountain summit takes a certain willpower, I'm no match for low-hanging fruit. It took a little convincing, but after assuring my family that wild blueberries are safe to eat, they flattered me by tasting a few and joining me in a mountain-climbing battle cry: "Power Surge!" My six-year-old proceeded to summit both Dorr and Cadillac, crossing a the rocky Gorge trail in between. I'm willing to bet the berries had something to do with it. Foraging is as old as time, and newly in vogue. An ecologist in New York City leads "food tours" to identify blackberries in local parks. A group in Nashville organizes an annual Tour de Plants to help residents identify edible plants growing in the community. Rock Creek Park is purportedly a hotbed of wild edibles, but laws on foraging in the District are very restrictive. Demand for local produce drives up market value. Have you seen the price of berries and fungi at farmer's markets?! With a little effort, the berry-obsessed can save a lot of money, breathe fresh air, and gain the satisfaction that comes with self-sufficiency. Berries grow wherever birds drop seed. Most berries are found on bushes and ground creepers, but trees bear all sorts of edible small fruit. It is illegal to remove plants from parks, but picking berries is perfectly fine. In Maine, the law states that berries may be foraged for personal consumption, but not for sale. I ate my fill on the mountainside, but purchased several quarts from a local farmers market to make preserves. Back in my hometown, I forage for blackberries and raspberries. They grow on brambles along woodland paths, where birds and other foragers fight over them. Watching other foragers is a good way to know if you're about to poison yourself, or not. When berry picking, it's best to go with someone who knows. Never eat berries in areas where pesticides are routinely used. When berry picking on mountainsides, make a lot of noise. Bears and other wildlife share our culinary lust for little blue and red gems. Of course, you can always visit a local farm, where you can pay to pick your own berries. 2. Pour 2 tablespoons melted butter into the bottom of a 2-quart dish coated with cooking spray. 3. Combine peaches, blackberries, and 1 tablespoon flour in a large bowl; toss gently. Add 1/4 cup sugar and ginger; toss gently to combine. Pour peach mixture into prepared baking dish. Lightly spoon remaining 1 cup flour into a dry measuring cup; level with a knife. Combine 1 cup flour, remaining 3/4 cup sugar, baking powder, and salt in a large bowl, stirring with a whisk. Add remaining 2 tablespoons melted butter and milk, stirring with a whisk. Pour batter evenly over fruit mixture. 4. Bake at 350° for 1 hour and 10 minutes or until golden brown.